Back in May 2015, on a fairly sunny but very windy day, my best Buddy (Graeme Jackson) and I headed on a trip to Salcey Forest. Armed with some of my Juggling props, we found some scenic spots (a different one for each video) and made some Video Tutorials that you might find useful. Please like, share and enjoy! You can find many more Juggling Tutorials by visiting the Tricks section of my website or the Showreels & Tutorials Playlist on my YouTube Channel. This video clip was created as a follow up to my existing Horizontal Devilstick Tricks video which is the most popular on my YouTube Channel. You can find over 130 Juggling Video Clips by visiting Steve the Juggler’s YouTube Channel or you can access each YouTube Playlist directly by clicking on the links below. Please enjoy, share and Subscribe! 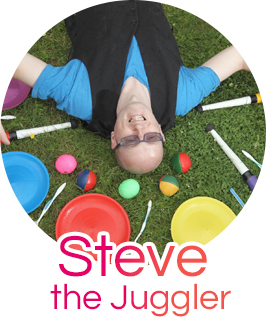 You can hire Steve the Juggler to perform for all occasions. Find out about his wide range of Juggling Services by visiting the Juggler for Hire section on this Jugglingworld website. Thanks for watching!